When God created His plan for His children, He knew that we would need guides to teach us all the things we would need to know. Over the span of generations upon generations, babies are sent to homes with mothers and fathers who have experience and wisdom. All parents have a sacred duty to give their innocent children boundaries and rules. While children should have a span of freedom to learn and explore, the mature parents are the guardians of the limits and the keepers of the gates. True shepherds do not drive the sheep by force or fear. Yet, the shepherds, because of their life experience, do know the very best pastures for grazing, and the sources of clean water. And so they carefully guide the sheep to the places where they will be nourished and filled with the best grasses, and refreshed by the purest water. Once the flock is filled with the nutrients they need, they are free to frolic and play in the pastures, all the while, under the protection and watchful eye of the shepherd who truly loves them. As the sun dips below the hillside, the sheep are gathered in and surrounded by walls of protection. Homeschooling parents are like the shepherds from days of old. They love their little lambs, providing nourishment and protecting them from the wolves or thieves that can prey upon them. They are not motivated to teach their children because of payment; rather, they have a natural interest and concern for the quality of education their children. They also wish to protect their children from the enemies who hope to deceive them with lessons that fill them with educational and spiritual "junk food." I grew up in a home where my parents both had a great appreciation for history. My mother also had a love for beautiful artwork, literature, music, and poetry. I read "classics" from a very young age because of the suggestions my mother made, and the example she set of reading, herself. When I reached first grade, my mother enrolled me in piano lessons, which I continued taking until I was seventeen. She had also encouraged my love of singing and performing throughout my childhood and teen years, and I could count on her to attend every recital, concert, and production I participated in. We did not have a lot of money, but she sacrificed and did all she could to barter and help out in order for me to excel at my interests. When I wanted to quit, she was there to encourage and challenge me to keep going. I was enriched and filled with the beautiful and virtuous. Of course, I occasionally dabbled in the things of life that were not as nourishing-- and some things that were even a bit poisonous. But I would be drawn back to the siren song of the bountiful educational feast my mother was constantly spreading before us. I have been called by God to shepherd my little (okay, my large) flock through many dangers, bypassing tempting fields off the path, and gathering them into verdant pastures where they will be guarded, nurtured and fed. There are times when lambs seek to explore and experiment. 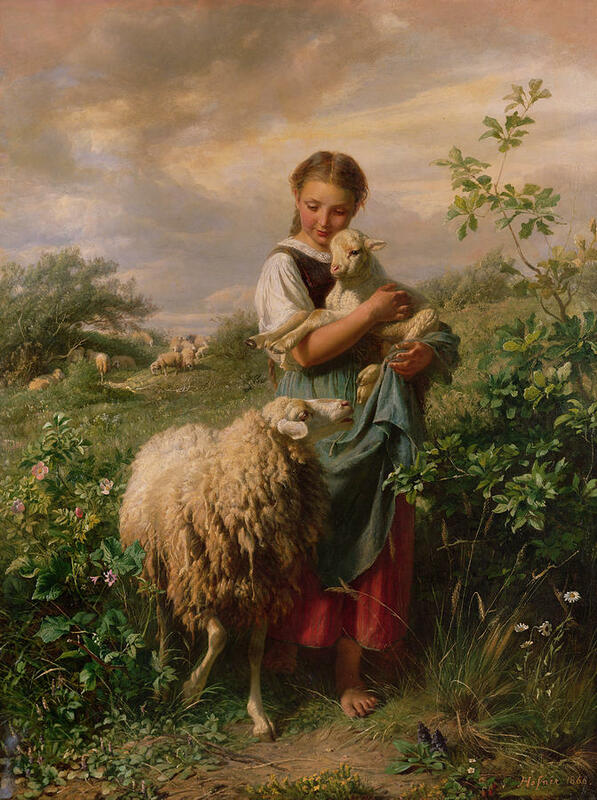 Loving shepherds do not let their young and inexperienced little ones wander aimlessly without guidance. Wise parents take the time to research, ponder, pray, and then create an educational plan for each child in their care. Then, with those plans in mind, they gather wholesome resources, books, classes, and experiences for their students. Next, they guide their children to develop study skills through each subject, asking questions, discussing ideas, following up with assignments, holding them accountable to commitments, and challenging them to attain new levels of excellence. Of course, there is a time and place for each thing on the list above, and we will cover those in the coming weeks. But NOW is the time for us to pray, to ponder, and to learn all we can about what our little lambs need in order to face the world outside our little pastures. This is not a step that can be done in one day, but in creating a plan of action, we will make the journey easier, and more pleasant, too. Thank you for reading all of my philosophies and thoughts about these changes I have made in my homeschool. I am almost done sharing my reasoning behind the name of this new blog. Next time, I will cover the last element: "Walk Beside." I love the image of the shepherd and his sheep. It's such a good one because you're right, the shepherd leads them and guides them through things they must do (like go to the field of math...ahem) but once they are there and have partaken the sheep are free to explore until it is time to move to the next field under the shepherd's guidance. Thank you for this wonderful image. It's interesting, I too am finding that my little lambs need something very similar. I believe we are heading down similar roads!